John Howard Richard Freeborn moved to Sutton after graduating from Cambridge in 1914. He rang at Benhilton several times in 1915, but then – despite having lost the sight of his left eye following an accident in his youth – managed to obtain a commission in the York and Lancaster Regiment. His existing injury meant he had no overseas service, and finished the war a captain having spent much of his period in the army as an adjutant to regiments of the Volunteer Training Corps (the Sutton unit of which he had been involved with even before receiving his commission). He was a regular ringer in Benhilton again from late 1918 into 1919. He was commissioned again in the Second World War, that time serving between 1940 and 1943, and leaving the army with the honorary rank of major, after which he was universally known as Major Freeborn. He is not listed on the original roll of honour, for reasons that are now a mystery. Freeborn was the son of the Revd Albert Corsellis Richard Freeborn, Vicar of Kidlington, Oxfordshire, and Miriam Elizabeth (or Elisabeth) Howard of Biddenham, Bedfordshire. They had married at Biddenham in 1886. Freeborn’s paternal grandfather, Dr Richard Fernandez Freeborn was a well-known GP in Oxford, with a wide practice among Oxford’s dons from 38/39 Broad Street (demolished in 1937 to make way for the New Bodleian). Unlike most of those named on the original roll then he was from the professional (upper-)middle class, this makes research somewhat easier as many life events can be traced via announcements in the pages of The Times. He was born on 28 October 1887 in Kidlington Vicarage. A brother, Charles Fernandez Freeborn, was born on 31 March 1890 at Biddenham Manor. At the 1891 census the family were together at Kidlington Vicarage along with three servants, a domestic nurse (Isabella Barker), a cook (Louisa Collis) and a housemaid (Rose E Dawson). Freeborn went to St Edward’s School, Oxford, in the 1901 census he is shown as a boarder. At school he was a keen rower, eventually Captain of Boats. In 1904 he learnt to ring at Kidlington where there was a strong band. Though his father doesn’t ever appear to have been a ringer himself, he was very supportive of the local ringers, and the Oxford Diocesan Guild. A Times notice on 19 January 1906 reported that Freeborn had been “elected to the academical clerkship vacant for a bass voice at Magdalen College”, presumably a choral scholarship in effect (his obituary does say that he continued to sing for many years). The 1905 Oxford University Calendar does indeed show a vacancy among the academical clerkships, but the 1906 volume does not include Freeborn among those named. It is not clear if Freeborn only filled the post for the remaining part of the academic year, or if there was some other reason he did not continue in the role. He certainly does not seem to have taken a degree, the University War List does show him as a Magdalen man, and seems to suggest that he matriculated in 1916, by which time he had already been commissioned (1916 may simply be a typo for 1906). It is known that at some point in his youth he had some sort of accident that led to the loss of sight in his left eye, no exact date is given in any source yet found: it may be possible that this is also linked to why he did not continue at Magdalen. I have not been able to uncover what he did for the next few years. However, the 1911 census shows him staying at a house in Sandwich, Kent, temporarily employed by the firm of J P White, which specialised in architectural woodwork. The house he was staying in, 34 New Street, was the home of Dr John William Harrisson and Charlotte Emily Harrisson. Freeborn was listed merely as a visitor to the household, however, a 1910 silver wedding announcement in The Times shows that Charlotte Emily’s maiden name was Freeborn, and she was a sister of the Revd Albert Corsellis Richard Freeborn (who celebrated at the marriage), so in fact he was staying with his aunt and uncle. Later in 1911 Freeborn entered Clare College Cambridge to read history, though he would have been on the verge of turning 24, which would have been rather unusual at that time. While at Clare he developed some sort of heart problem which led to his giving up rowing (though he remained a frequent spectator at Henley and other major events), and he took up (or perhaps gave greater focus to) throwing the hammer and was awarded his Blue. Bellringing also remained a major pastime, and he was a well-known member of the Cambridge University Guild of Change Ringers, his name fairly frequently occurs in peal and quarter peal reports from all round the country. In 1913 (while still an undergraduate, though aged 26) Freeborn married (Catherine) Muriel Holme at the Priory Church, Great Malvern on 14 October (according to a report in The Ringing World. She was about 32 (she is shown as 30 in the 1911 census), so six or seven years older than Freeborn. She was the daughter of George Jackson Holme, a dentist. Curiously there appear to be two sets of registrations for the marriage, one as expected in the 4th quarter 1913, in the Upton-on-Severn registration district, but also in the 3rd quarter in the Bath registration district! Is it possible there was a secret marriage earlier in the year? Muriel’s father was a widower, and earlier censuses show she had older sisters – did she see this as her last chance to escape spinsterhood and looking after her father as he got older (he was 65 in 1911)? Freeborn graduated in 1914 and it appears he and his wife settled in Sutton, Surrey. By now war had broken out, and given his background it is no surprise that Freeborn was desperate to obtain a commission – he had previously been a member of the OTC at Cambridge (and may have had other Territorial Force experience according to some reports). However, his damaged left eye meant that he was repeatedly turned down. Instead he joined the 9th (Sutton) Surrey Volunteer Training Corps. Through the influence of the retired artillery officer, General Sir Josceline Wodehouse, who commanded the Surrey VTC Freeborn was eventually granted a commission on 4 July 1915. He was commissioned into 2/4th (Hallamshire) Battalion, York and Lancaster Regiment – quite why this regiment (rather than the East Surreys who recruited in Sutton, or the Oxfordshire and Buckinghamshire given where he was born and grew up) is unclear. At the time 2/4th York and Lancs were stationed at Beverley. However, on 23 August 1915 Freeborn found himself in Newcastle and rang in a touch of Stedman Caters at the cathedral. Possibly his trip was connected with the battalion’s subsequent move to Gateshead in November 1915. By the time of that move it seems he may have transferred to 3/4th Battalion, the 3 December 1915 Ringing World names him among the ringers at a funeral in Doncaster (the date of the service is not given unfortunately). Such a location wouldn’t make sense if he had moved with 2/4th to Gateshead, but 3/4th were stationed at Clipstone Camp which is a little more plausible. Certainly a short profile (with photo, which unfortunately I don’t have permission to reproduce here) published on 3 March 1916 states he was with 3/4th Battalion at that point. On 25 June he was promoted temporary captain. On 11 April 1917 he was seconded to act as adjutant to a Battalion of a Volunteer Regiment – in effect he returned to the VTC but in a full-time (paid) role. On 27 January 1918 Muriel E H Freeborn was born at Streatham Manor in the Wandsworth registration district. In early December 1918 Freeborn was back at Benhilton, ringing for the funeral of John Webb. As previously described on this blog, Webb was the leader and driving force of the Benhilton ringers, but was a victim of the Spanish flu epidemic. 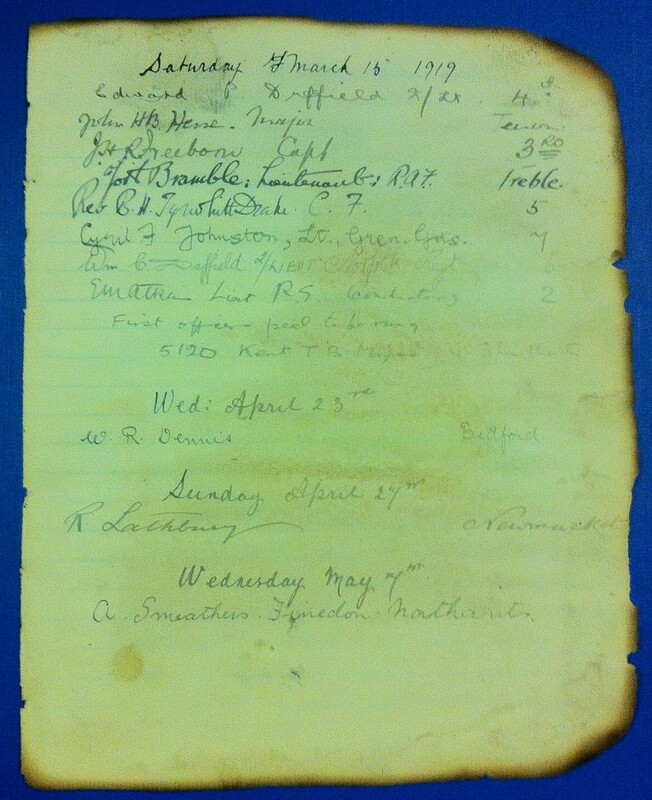 Page from the original visitors’ book at Putney with the signatures of the officers who rang a peal there on 15 March 1919 – the page bears the marks of the arson attack which caused major damage to the church in 1973 (destroying the bells). On 15 March 1919 Freeborn was among the eight officers (two RAF and six army) who rang a peal of Kent Major at Putney: the first peal by an all-officer band. Two of the others were also Surrey men, Lieut Cyril F Johnston, and Major J H B Hesse, who are named on the original roll. This became a busy year of peal ringing for Freeborn (in fact he started with a peal at Beddington 1 March). On 20 March was a halfmuffled peal of Stedman Triples at St George-the-Martyr, Southwark, which marked the deaths (while serving) of three of the tower’s ringers in 1918. Then came another peal at Beddington on 21 April. The officers’ band (with two additions) reconvened at South Croydon on 3 May 1919 for a peal of Grandsire Caters, this marked a parade by various colonial troops through Croydon. This was also reported to be Freeborn’s 50th peal, however, the composition (made specially for the occasion by Lt E Maurice Atkins, RE, who also conducted) was subsequently proved to be false. 10 May saw a peal at Bedford and 22 May at St Giles-in-the-fields. Several of these peals also involved Hesse, and he organised a College Youths trip to Somerset in June (Freeborn had joined the College Youths in 1911), this included a peal at Wrington (with which Hesse was closely connected) on 7 June. Freeborn subsequently wrote an account of the tour which was published in The Ringing World – apparently the local cider made a great contribution to the enjoyment of their activities. 9 July 1919 saw a second attempt for an all-officer ten bell peal at South Croydon (with one change of personnel). There was no mistake in the composition this time, and the peal is marked by a peal board, and I’m told a photo of the band also hangs in the ringing room. On 16 January 1920 Freeborn relinquished his acting rank as captain as he ceased to be employed as adjutant. This probably marked his demobilisation (I’ve not found the final relinquishment of his commission – after the war he was universally known as Captain Freeborn). On 29 January he boarded SS Peleus for Hong Kong (from Liverpool). He gave his occupation as lecturer, which fits with the statement in his obituary that he taught at the University of Hong Kong. At the time of his departure his wife was either heavily pregnant with their second child (another daughter), or nursing a newborn. the birth of Dorothy M S Freeborn was registered in the Epsom registration district in the first quarter 1920. Prior to his departure, it appears the family were living at Bemerton, Cedar Road, Sutton. He had written to The Times in 1919 complaining that the Amateur Athletics Association had opted to hold their championship on the same weekend previously announced for the Henley Regatta – he couldn’t believe that he would be the only one with an interest in both, and he felt it was important to give as much encouragement as possible to all sports as they were re-established following the war. Peleus arrived at Singapore around 8 March 1920 and was then to continue to Hong Kong (and ultimately Japan). Freeborn returned the following the year, via Canada, arriving at Liverpool aboard SS Metagama from Montreal. He is again described as a lecturer, but gives his permanent address as Kidlington Vicarage. Following his return Freeborn took hammer throwing increasingly seriously, and won international selection on more than one occasion. In 1924 he gained pre-selection for the Summer Olympics to be held in Paris that year. Entries for the Games had to be made prior to the British Championships on 20-21 June when the final British selections would be confirmed. In the event the only British hammer thrower to be selected was Malcolm Nokes. This reflected the general situation throughout the period with Freeborn generally being the British number two to Nokes as British number one. He generally competed as a member of the Achilles Club, he was placed at the AAA championships several times, and between 1924-7 won the Southern title four times. Later in life he was the official surveyor to the AAA. He continued to support hammer throwing and served as both President and Vice-President of the Hammer Circle, and in 1953 donated the Freeborn Cup – after a few changes over the years this is now awarded each year to the British hammer thrower who throws the furthest each year. Kelly’s Directory for Buckinghamshire for the years 1924-1931 (at least) gives Freeborn’s address as The Dell, Chalfont Station village, Amersham. He was presumably training as an architect (and surveyor) throughout this period – in 1933 he was elected an Associate of the Royal Institute of British Architects. With the outbreak of the Second World War, it would appear Freeborn was no less keen to serve his country again. Once more there was a bit of a delay before he was commissioned, this time in the Pioneer Corps, reverting to the rank of lieutenant. The war also saw the marriage of his two daughters, first the younger, (Dorothy M) Sonia married Hamilton James Elverson at St Mary Magdalene, Munster Square on 27 June 1942. He was the son of Major and Mrs Elverson on 10 The Green, Marlborough. The Times announcement gave the Freeborn’s address at the time of the marriage as Coombe House, Oxford (presumably the building in the churchyard of St Thomas described in a report in this edition of The Oxon Recorder). Elverson was commissioned into the Royal Army Medical Corps soon after. Freeborn resigned his commission on 13 March 1943, by then he held war substantive rank as a captain, but was granted the honorary rank of major, suggesting he had acted in that capacity at some point. He was ever after known as Major Freeborn. His elder daughter, Muriel E H Freeborn, married Robert W Mathews in the Amersham registration district in the 4th quarter 1944. Freeborn celebrated his Golden Wedding on 14 October 1963, ringing a peal of Stedman Triples at Kidlington to mark the day. Sadly Muriel died in Churchill Hospital, Oxford, on 4 January 1964 aged 85. She was cremated at Headington on 9 January. Probate was granted to Freeborn (described as a retired chartered architect) on 7 February, she left an estate of £1596. After this Freeborn went to live with one of his daughters in Cambridge. He continued to ring, being a regular Sunday ringer at Great St Mary’s. He also still rang the odd peal, including one of Stedman Cinques at Saffron Walden on his 80th birthday, 28 October 1967. Having now been widowed for just over four years, he remarried on 26 April 1968, to Mrs (Mary) Ada Miller, he first husband, Cambridge solicitor S T Miller, having died a year earlier. His address prior to the wedding was 17 Luard Road (and hers 246 Hills Road). After the wedding they moved to 52 Queen Edith’s Way. The wedding was at Great St Mary’s, and was naturally accompanied by bellringing. The bells of Kidlington were also rung. After just over three years of this new marriage, Freeborn died on 5 June 1971. His funeral was at Great St Mary’s on Thursday 10 June. A quarter peal was rung at St Andrew’s, Cambridge, the band comprising former masters of the Cambridge University Guild. His ashes were interred at Kidlington on Sunday 13 June, once again accompanied by ringing, both at Kidlington and Christ Church Cathedral, Oxford, where he had also often rung in his younger days. Obituaries were published in The Ringing World and in the Clare College magazine. The Clare College obit reveals that he enjoyed exercising his dining rights in college after his return to Cambridge, and he continued to support the college boat. It also shows that he advanced to Fellow of the Royal Institution of British Architects (FRIBA) and been made a Fellow of the Royal Institution of Chartered Surveyors (FRICS). This entry was posted in 1971, 4th Battalion, Benhilton, June and tagged Bellringing, Benhilton, Cyril Frederick Johnston, First World War, John Harley Bridges Hesse, John Howard Richard Freeborn on 02/12/2013 by davidunderdown95. Just two ringers are listed on the original roll for St John’s, Croydon (Croydon Minster). E Elliott has so far resisted identification – there are around 70 possible candidates in the 1911 census. Rather easier to resolve was the identity of C F Johnston. Cyril Frederick Johnston was one of the great personalities of ringing in the first half of the twentieth century. The family firm of Gillett & Johnston whose bell foundry and clock factory was in Croydon had started off making church clocks, and this led naturally into first clock bells and then church bells more generally. It was Cyril who was fascinated by the idea of harmonic tuning of the bells, suggested by Canon Simpson and first put into practice by Taylor’s of Loughborough. After rather complicated war service with one of the Public Schools’ Battalions of the Royal Fusiliers, and then the Grenadier Guards, Cyril was released from the army following the death of his father in 1917 to work under the Ministry of Munitions at the family firm. Peacetime clock manufacture had turned to wartime production of fuzes for shells. After the war he proved to be a flamboyant salesman, and won many prestigious contracts, expanding into the manufacture of bells for carillons, particularly in the US. He was perhaps a little too relaxed about the fundamentals of business and the firm eventually ran into financial problems and he lost control after having to get external investment. On one of his various trips to the US he fathered a child by an American nurse. She was Jill Johnston, who became a radical lesbian feminist, but also wrote an interesting account of Cyril’s life, and how she came to terms with his abandonment of her mother. The book is well worth a read, England’s Child: The Carrillon and the Casting of Big Bells. Not listed on the original Surrey roll, but to be found on the Central Council roll of honour, listed as a member of the Cambridge University Guild, is the Reverend Cecil Herbert Schooling. He became curate at St John’s in 1910 and joined up as a chaplain. He is recorded on the church war memorial, but it is not clear if he ever did ring there. However, it seems right his name should also be connected with the ringers of Croydon. This entry was posted in Croydon Minster, Uncategorized and tagged Bellringing, Cecil Herbert Schooling, Croydon Minster, Cyril Frederick Johnston, First World War, Gillett & Johnston, St John's Croydon on 15/12/2012 by davidunderdown95.